I found recently that Apple’s Mail.app was behaving erratically: the notification for unread emails wouldn’t disappear, even after reading all emails; junk email was properly marked as such, but refused to go into the spam folder and the rules I had set for certain senders didn’t work. It all started after I signed up for iCloud to synch all my email accounts. That should have been my first clue to what the problem was, but it took me some time to realize what was going on. It turns out that iCloud is not smart enough (yet?) to realize that some of the synched accounts were already in place locally on my machine. It would then duplicate my locally set accounts with those from iCloud. The problem went away once I removed those duplicates causing the problem. I still haven’t decided wether I want all my email accounts in the cloud. I don’t need all of them in all of my devices (I don’t really check all my emails on my iPhone, for example.) So, I decided to keep my most used accounts in the cloud and keep the less used ones on the MacBook that I use most frequently. If you have the same problem, you should check your “Internet Accounts” in System Preferences and remove those you don’t want them there. A few years ago, during my master years, I was studying the trajectory that a photon would take when passing by one of these space-time bending black holes (the null geodesics around a Kerr black hole, in technical terms.) I was then working under Dr. Richard Price and with another student, Travis Miller. The idea was to study how one of these black holes would affect the electromagnetic jet from a pulsar that is orbiting the hole. By the end of the research, when all mathematical problems were sorted out, it became clear that I would need some kind of visualization tool to confirm that the geodesics were being calculated correctly. That’s why I decided to start my first little project for a program in OS X. The result was a Geodesic Plotter, so to speak. This app is basically a GUI wrapper to a set of C functions developed to calculate the final direction of a ray of light when it is far enough away from the black hole so that it’s not affected anymore by its gravitational field. 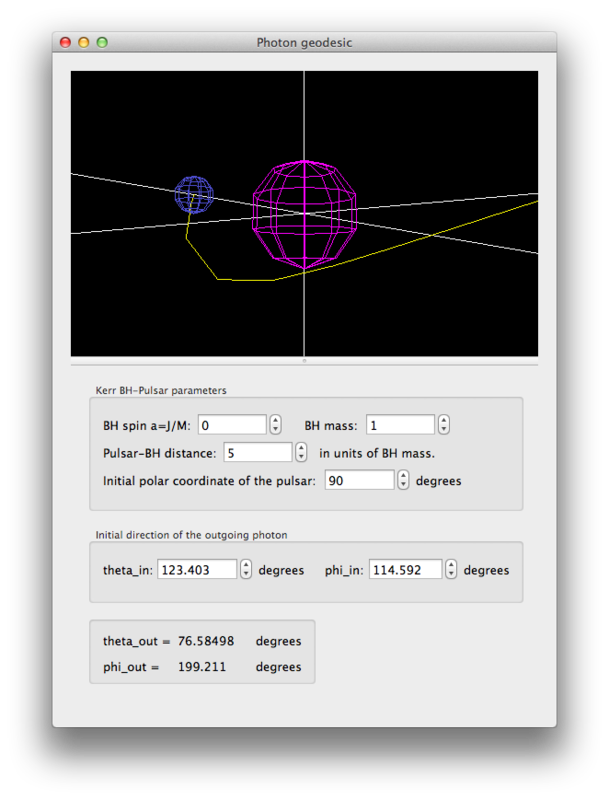 The input conditions are the pulsar position and the initial shooting direction of the photon from the pulsar. The pulsar is not restricted to the rotational plane of the black hole. It can be placed anywhere on space. The black hole parameters for mass and angular momentum can be varied independently too. The program uses OpenGL for rendering, and it updates the screen automatically when parameters are changed using the text boxes or arrow buttons. This is especially useful to explore the effect that the initial direction has on the final direction of the photon trajectory. One can even try to find those special directions for which the photon revolves several times around the black hole before it can escape into infinity. The GUI project was really fun to work with and it was done during a visit to Argentina during the (northern hemisphere’s) summer. After the first try, two more versions followed that improved responsiveness (mainly the automatic update of the view). There is still room for improvement and some bugs need to be fixed, but hopefully they will be resolved in the future versions of the program. The program can be downloaded from Dropbox following this link.